This incredible pie is loaded with macadamia nuts and goodness. The white chocolate melds with the other ingredients to create a kind of caramel sauce. Be warned: this pie is RICH. Cut small slices. Pair it with a scoop of vanilla ice cream, and use the extra sauce from the pie plate as a topping! Pie keeps well covered in the fridge for at least a week. Preheat oven to 400-degrees. Place a cookie sheet in the oven to heat up as well; this will help prevent a soggy bottom on the crust. 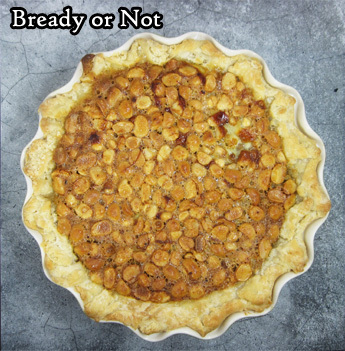 Place white chocolate chips and macadamia nuts in the unbaked pie crust, and place it in the fridge to chill. In a mixing bowl, lightly whisk the eggs, then add the corn syrup, brown sugar, vanilla, and salt. Pour the filling over the white chocolate and macadamia nuts. Cover the pie crust edges with foil. Bake for 15 minutes at 400-degrees. Remove the foil. Reduce the oven temperature to 350-degrees and bake for another 25 to 30 minutes, until the top is lightly brown and the filling is set. Cool to room temperature before cutting.